6717 CR 5577 PRRX EMD 11-1994 946506 946506-3 NS LEADER/PTC Equipped. Unit currently stored, but still on the active roster. 6718 CR 5578 PRRX EMD 11-1994 946506 946506-4 NS LEADER/PTC Equipped. 6719 CR 5580 PRRX EMD 11-1994 946506 946506-6 NS LEADER/PTC Equipped. 6720 CR 5581 PRRX EMD 11-1994 946506 946506-7 NS LEADER/PTC Equipped. Unit currently stored, but still on the active roster. 6721 CR 5582 PRRX EMD 11-1994 946506 946506-8 NS LEADER/PTC Equipped. Unit currently stored, but still on the active roster. 6722 CR 5584 PRRX EMD 11-1994 946506 946506-10 NS LEADER/PTC Equipped. Unit currently stored, but still on the active roster. 6723 CR 5586 PRRX EMD 11-1994 946506 946506-12 NS LEADER/PTC Equipped. 6724 CR 5587 PRRX EMD 11-1994 946506 946506-13 NS LEADER/PTC Equipped. 6725 CR 5590 PRRX EMD 11-1994 946506 946506-16 NS LEADER/PTC Equipped. Unit currently stored, but still on the active roster. 6726 CR 5592 PRRX EMD 11-1994 946506 946506-18 NS LEADER/PTC Equipped. 6727 CR 5593 PRRX EMD 11-1994 946506 946506-19 NS LEADER/PTC Equipped. 6728 CR 5595 PRRX EMD/CR 11-1994 946506 946506-21 NS LEADER/PTC Equipped. Unit currently stored, but still on the active roster. Unit is to be sold by NS via auction. 6729 CR 5596 PRRX EMD/CR 12-1994 946506 946506-22 NS LEADER/PTC Equipped. 6730 CR 5598 PRRX EMD/CR 01-1995 946506 946506-24 NS LEADER/PTC Equipped. 6731 CR 5600 PRRX EMD/CR 01-1995 946506 946506-26 NS LEADER/PTC Equipped. Unit currently stored, but still on the active roster. 6732 CR 5602 PRRX EMD/CR 02-1995 946506 946506-28 NS LEADER/PTC Equipped. Unit currently stored, but still on the active roster. 6733 CR 5603 PRRX EMD/CR 02-1995 946506 946506-29 NS LEADER/PTC Equipped. Unit currently stored, but still on the active roster. 6734 CR 5605 PRRX EMD/CR 03-1995 946506 946506-31 NS LEADER/PTC Equipped. Unit currently stored, but still on the active roster. 6735 CR 5606 PRRX EMD/CR 03-1995 946506 946506-32 NS LEADER/PTC Equipped. Unit currently stored, but still on the active roster. 6736 CR 5607 PRRX EMD/CR 03-1995 946506 946506-33 NS LEADER/PTC Equipped. Unit currently stored, but still on the active roster. 6737 CR 5608 PRRX EMD/CR 03-1995 946506 946506-34 NS LEADER/PTC Equipped. Unit currently stored, but still on the active roster. 6738 CR 5610 PRRX EMD/CR 03-1995 946506 946506-36 NS LEADER/PTC Equipped. 6739 CR 5611 PRRX EMD/CR 04-1995 946506 946506-37 NS LEADER/PTC Equipped. Unit currently stored, but still on the active roster. 6740 CR 5613 PRRX EMD/CR 04-1995 946506 946506-39 NS LEADER/PTC Equipped. Unit currently stored, but still on the active roster. 6741 CR 5617 PRRX EMD 04-1995 946530 946530-3 NS LEADER/PTC Equipped. Unit currently stored, but still on the active roster. 6742 CR 5618 PRRX EMD 04-1995 946530 946530-4 NS LEADER/PTC Equipped. Unit currently stored, but still on the active roster. 6743 CR 5620 PRRX EMD 04-1995 946530 946530-6 NS LEADER/PTC Equipped. Unit currently stored, but still on the active roster. 6744 CR 5621 PRRX EMD 04-1995 946530 946530-7 NS LEADER/PTC Equipped. Unit currently stored, but still on the active roster. 6745 CR 5622 PRRX EMD 05-1995 946530 946530-8 NS LEADER/PTC Equipped. Unit currently stored, but still on the active roster. 6746 CR 5623 PRRX EMD 05-1995 946530 946530-9 NS LEADER/PTC Equipped. Unit currently stored, but still on the active roster. 6747 CR 5624 PRRX EMD 05-1995 946530 946530-10 NS LEADER/PTC Equipped. Unit currently stored, but still on the active roster. 6748 CR 5625 PRRX EMD 05-1995 946530 946530-11 NS LEADER/PTC Equipped. Unit currently stored, but still on the active roster. 6749 CR 5626 PRRX EMD 05-1995 946530 946530-12 NS LEADER/PTC Equipped. Unit currently stored, but still on the active roster. 6750 CR 5629 PRRX EMD 06-1995 946530 946530-15 NS LEADER/PTC Equipped. Unit currently stored, but still on the active roster. 6751 CR 5632 PRRX EMD/CR 06-1995 946530 946530-18 NS LEADER/PTC Equipped. Unit currently stored, but still on the active roster. 6752 CR 5636 PRRX EMD/CR 06-1995 946530 946530-22 NS LEADER/PTC Equipped. Unit currently stored, but still on the active roster. 6753 CR 5638 PRRX EMD/CR 06-1995 946530 946530-24 NS LEADER/PTC Equipped. Unit currently stored, but still on the active roster. 6754 CR 5640 PRRX EMD/CR 07-1995 946530 946530-26 NS LEADER/PTC Equipped. Unit currently stored, but still on the active roster. 6755 CR 5641 PRRX EMD/CR 07-1995 946530 946530-27 Unit currently stored, but still on the active roster. 6756 CR 5643 PRRX EMD/CR 07-1995 946530 946530-29 NS LEADER/PTC Equipped. Unit currently stored, but still on the active roster. 6757 CR 5644 PRRX EMD/CR 07-1995 946530 946530-30 NS LEADER/PTC Equipped. Unit currently stored, but still on the active roster. 6758 CR 5646 PRRX EMD/CR 08-1995 946530 946530-32 NS LEADER/PTC Equipped. Unit currently stored, but still on the active roster. 6759 CR 5648 PRRX EMD/CR 08-1995 946530 946530-34 NS LEADER/PTC Equipped. Unit currently stored, but still on the active roster. 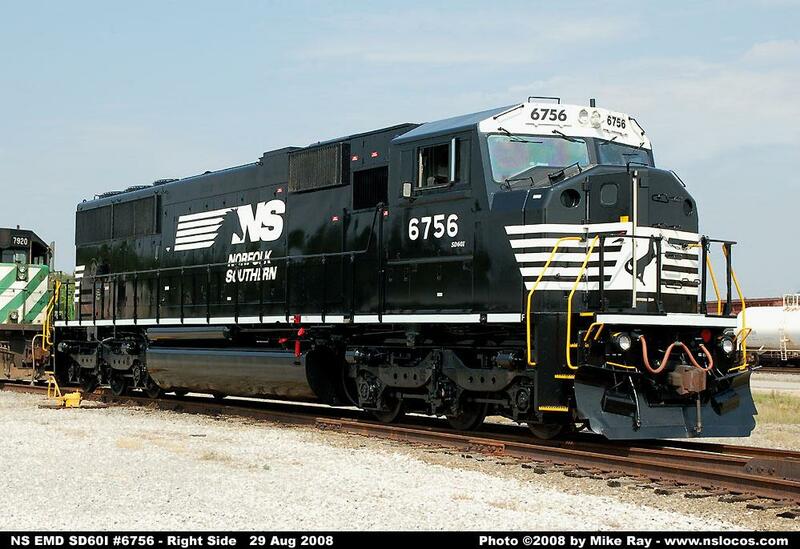 6760 CR 5650 PRRX EMD/CR 08-1995 946530 946530-36 NS LEADER/PTC Equipped. Unit currently stored, but still on the active roster. 6761 CR 5651 PRRX EMD/CR 09-1995 946530 946530-37 NS LEADER/PTC Equipped. Unit currently stored, but still on the active roster. 6762 CR 5653 PRRX EMD/CR 09-1995 946530 946530-39 NS LEADER/PTC Equipped. Unit currently stored, but still on the active roster. 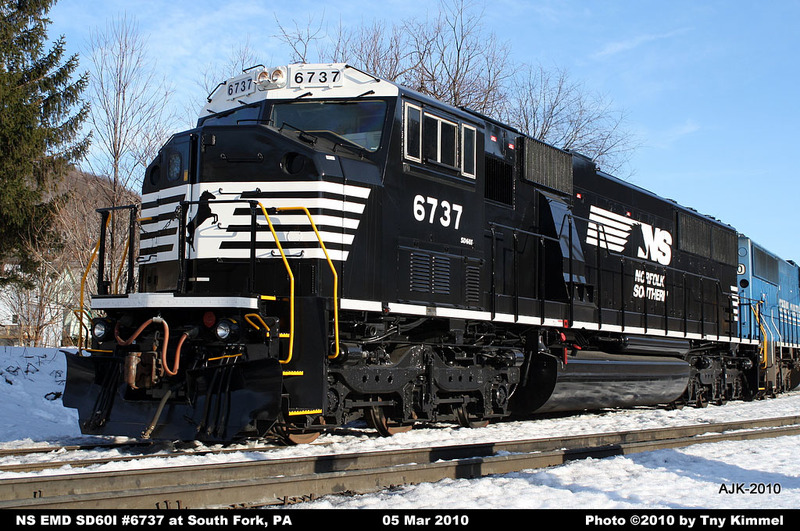 Units 6728-6740 and 6751-6762 were assembled by Conrail Juniata Locomotive Shop. Units 6717-6737 are cleared for use at the PPL Strawberry Ridge, PA power plant rotary dumper.